S+S Separation and Sorting Technology GmbH of Schönberg, Bavaria, one of the world’s leading suppliers of machines and systems for the detection/separation of contaminants, for product inspection, and for the sorting of material flows, as from the end of March 2015 will present itself with a new company name and a new logo.These changes not only are superficial, they rather reflect the permanent development of the company. The name Sesotec internationally is pronounced almost identically by customers and employees. In practice it also is a decisive improvement that in digital media and alphabetical indexes Sesotec is much easier to find. 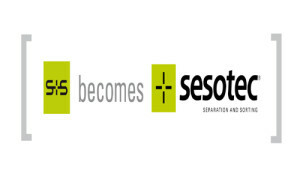 Furthermore, Sesotec is a strong name that signals the company’s leadership claim. Another advantage: The name Sesotec is easy to memorise because for eight years it already has been known as the company’s internet domain. A new logo also must be introduced to match the new name. Until now the “S+S” designation has been short enough to fit into the graphic symbol (green square). With Sesotec this is no longer possible. The new logo therefore comprises a graphic symbol and the word mark that is placed beside the figurative mark. To ensure that customers and partners will recognise that S+S becomes Sesotec, the figurative mark of the new logo in colour and form picks up the design of the previous logo.